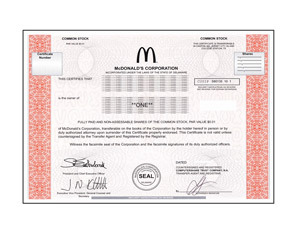 McDonalds Corporation operates and franchises one of the largest chain of hamburger fast food restaurants in the foodservice industry. These restaurants serve a varied yet limited, value-priced menu in more than 100 countries around the world. Imagine passing a McDonalds restraunt and hearing "I own that" from a child. You can make that happen!